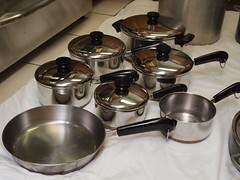 Anyone[*] want any pots and pans? We have a whole lot of pots and pans that are perfectly usable, except that they don't work with induction stoves (which we now have). Free to a good home! [*] Anyone local enough to pick them up, that is. 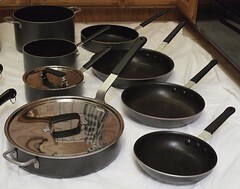 (A) Set of Ameriware ceramic-non-stick-coated pots and pans. Those cost quite a bit when I bought them and are mostly in really good condition (the small frying pan is a bit scuffed up, but since it's NOT teflon, it should not pose any health concern whatsoever). (B) Set of non-ferromagnetic stainless steel pots/pans with copper exterior on base. These are fairly cheap but also perfectly serviceable. Not non-stick, but surfaces are easy to clean and in good condition. 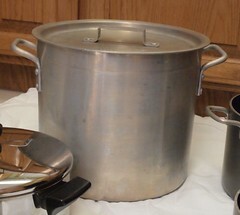 (C) 16qt Stock Pot, aluminum. Nice big stock pot. Has made many soups, baked beans, etc. (D) Two large, glass-lidded pans. (i) One unknown brand mostly rounded base (but has a flat area) and a high-domed lid. (ii) One Calphalon rounded-sided-but-mostly-flat frying pan.